nice tooth, thanks for showing us! Sweet piece!! Congratulations on the acquisition. Gratz! A fossil worth your name! Congratulations! You must be very happy! What a great tooth, well done mate! Very nice tooth! Your collection is growing quite a bit. Keep up the work! How did you ID it? Too small and is not fat enough to be a tyrannosaur tooth. Also, it's too recurved for a tyrannosaur. What other small raptors are known from the Hell Creek deposit that would match the one he has? Obviously Tyrannosaurs weren't breed in toy form, so what other suggestions might you have? T rex is thought to have been the size of an adult cat when it hatched. 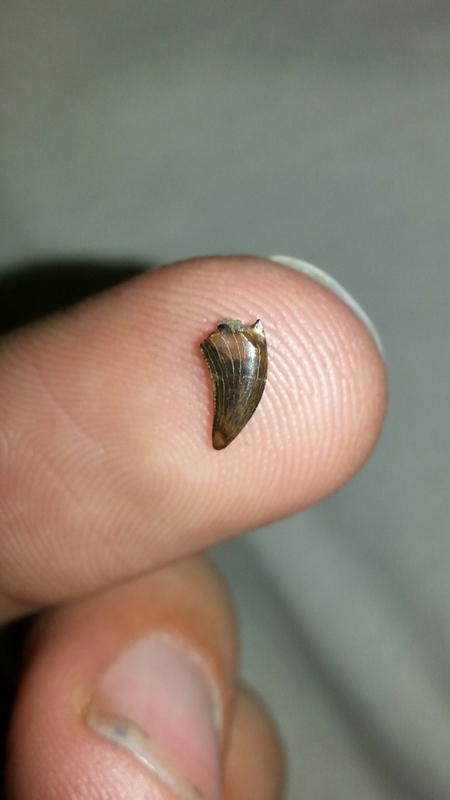 I have what 'may be' Tyrannosaurid teeth that small. However, isolated teeth are difficult to ID. Also the position of the tooth varies with position. I dont think there is a jaw specimen with intact teeth of a youngest tyrannosaur (I could be wrong). In general I find smaller Tyrannosaur teeth to be more robust than same size raptor teeth. However, sometimes we compare to previously tentatively identified teeth and mistaken identity perpetuates itself. In the Campanian Cretaceous, it can get iffy trying to to distinguish small Tyrannosaur and big Dromaeosaur teeth. Anyways, a nice tooth. A bit easier to ID in the Maastrichtian deposits. It has the gracile shape of a raptor. 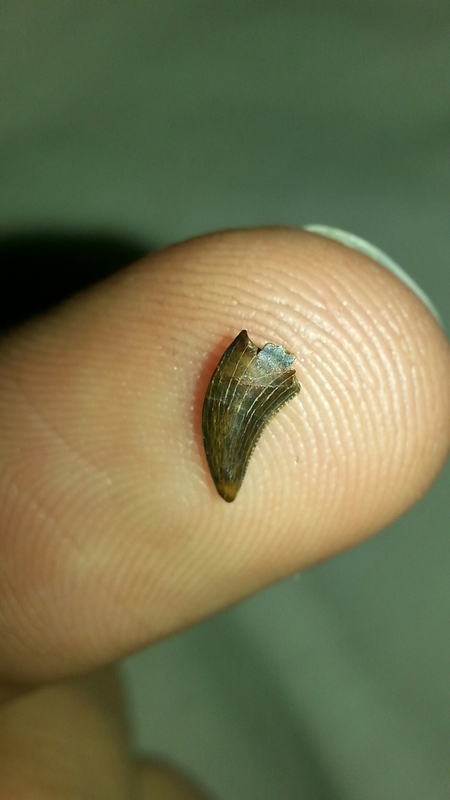 The tooth has nice serrations and has the best type of tip...intact but showing wear from real life. One wonders what the little guy sunk his tooth into. Raptor teeth are also identifiable by the serrations. The serrations on the back curve are generally larger than those on the front. And raptor teeth are indeed also recurved. It might even be possible to identify the raptor teeth to the species level by looking at the serrations more closely. Shape and number of serrations differ between species. There are also only two known raptors/dromaeosaurids present in the Hell Creek formation. Dakotaraptor and Acheroraptor. The latter being the smaller one. Hmm I didn't know the serrations differ between species, thanks for the info.